For several days following Sept. 11, 2001, planes were grounded throughout the United States. Satellite images during that time period show crystal clear skies across the contiguous United States. The clarity, researchers say, stemmed from the absence of jet contrails, and studies during that time period partly confirm what scientists have proposed over the past few decades: Contrails, a form of cirrus clouds, can change climate on short and long time scales. 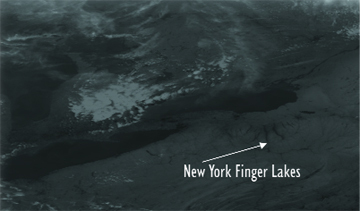 Skies over the Finger Lakes in upstate New York remained clear several days after September 11, when planes were grounded in the United States. But Canadian flights continued to make contrails that enhanced the cloudiness over Lake Erie, as shown here in a satellite photo taken Sept. 15, 2001. NOAA-14 Polar Orbiter AVHRR sensor. The temporary blank slate in the United States sky, however, provided an opportunity to contrail researchers to examine exactly how contrails form and disperse. The only contrails to cloud the sky during the few days when jets were grounded came from half a dozen military planes that flew over the Eastern seaboard. Minnis and his co-workers tracked them to see how they spread, presenting their results at a 2002 meeting of the American Meteorological Society and incorporating the data into models. The empty skies also allowed David Travis of the University of Wisconsin-Whitewater and his co-workers to determine how contrails might be changing local temperature. Their results, first published in Nature in August 2002 and further elucidated last March in the Journal of Climate, showed that during the days when jets were grounded in September 2001, sunshine increased the temperature at ground level instead of being reflected by contrails. At night, the researchers found, the absence of an insulating layer of contrails meant greater ground level cooling. Suddenly, almost like magic, for the three days following September 11 we had a sudden clearing and temperature variations that were larger than normal, Travis says. The team found the largest three-day change in any September over the past three decades, with an increased daily shift of an extra 1 degree Celsius on average under the temporarily clear skies. Regionally, the daily temperature swings over those three days were greatest in places that usually had the most cloud cover in fall, such as the Midwest. On a global scale, Minnis team reported in the April Journal of Climate that from 1971 to 1995, cirrus coverage increased over the northern oceans, the United States and Western Europe, matching growth in air traffic over those regions. Eastern Asia also saw an increase. Humidity measurements incorporated into the study, Minnis says, indicate where contrails (and cirrus) were likely to form. The team modeled cirrus cloud effects on climate, showing regional temperature increases of about half a degree Celsius. The dust and sand storms that have plagued Asia for millennia are becoming more frequent and intense, with some areas experiencing a fivefold increase in the last 50 years. The economic and human health costs associated with them will also rise unless governments join together to combat desertification, Korean and Chinese scientists told attendees of the 8th Special Session of the Governing Council of the United Nations Environment Programme (UNEP) in Jeju, Korea, last March 2004. 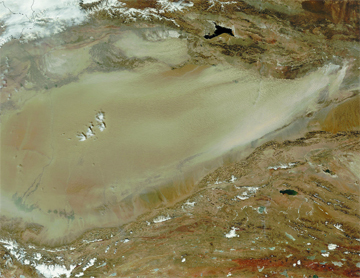 The Terra satellite captured this image of a dust storm over the Taklimakan Desert, in western China on April 7, 2004. Scientists say that dust storms are becoming more common in Asia, with increased pollution and desertification. NASA/Modis Rapid Response System. The storms originate in arid regions of northern China and Mongolia and blow across the Korean peninsula, where they are called Asian Dust, and Japan, where they are called Yellow Sand. The dust sometimes crosses the Pacific Ocean, reaching North America, and occasionally travels as far east as Cape Cod. The dust afflicts humans with respiratory problems, disrupts communication and transportation, and causes the loss of crops, livestock and human life. A May 1993 dust storm killed 85 people in western China, causing damage worth 550 million yuan (US$95 million in 1993). And in March 2002, a storm dumped more than 40,000 tons of sand per hour on the Korean peninsula, where the economic damage from storms that month alone exceeded 6 trillion won (about US$5 billion). Although dust and sand storms are the result of natural processes, the factors fueling their increasing size, intensity, frequency and health effects may not be, according to Youngsin Chun, a researcher at the Meteorological Research Institute of the Korea Meteorological Administration in Seoul, South Korea. According to UNEP, global warming, pollution and increased desertification, resulting from poor land management practices and population growth, are making the phenomena worse. In China, where 30 percent of the land surface is affected, desertification costs $6.5 billion each year, and the problem is spreading. Between 1994 and 1999, the Gobi Desert, one of the main sources of dust storm sand, grew by 52,400 square kilometers due to farming, grazing and deforestation. And that trend will likely continue, says Lance Leslie, a meteorologist at the University of Oklahoma. The arid desert regions of the world in general are expected to become drier, thereby in most cases, increasing the chances for dust-storms, Leslie says. The effects from global warming are most pronounced in the winter, Chun says, and warmer, drier winters can lead to dust storms in the spring. Also, as the dust and sand bind with human-made air pollutants, such as soot, she says, they are becoming even more of a human health hazard. At the Jeju conference, Klaus Toepfer, executive director of the UNEP, said that the program has begun assisting the governments of Northeast Asia through a joint project to develop a network of monitoring stations and early warning systems. Although short-term warnings are imperative for emergency management, long-term forecasts can give those in the path of a dust storm a greater opportunity to prevent loss of life and property. Predictive models are currently in routine use in China, and in experimental use in several other countries, says Leslie, who has co-developed a numerical predictive model for dust storms. Our predictive system, among others, is used for multi-week predictions and even seasonal predictions of conditions conducive to dust-storm development, Leslie says. These models take into account several complex factors, including surface-vegetation cover and land-surface types, as well as soil type, texture and moisture. Chun stresses that any long-term solution will have to involve all the countries of Northeast Asia working together to moderate the human factors that influence the storms.